Emperor Akihito of Japan is set to abdicate on 30 April 2019, which will make him the first Japanese Emperor to do so in over two hundred years. This marks the end of the Heisei period, and will precipitate numerous festivities leading up to the accession of his successor, Crown Prince Naruhito. The enthronement ceremony will likely happen on 22 October 2019. Akihito's younger son, Prince Akishino, is expected to become his brother's heir presumptive. In 2010, Emperor Akihito informed his advisory council that he would eventually like to retire from his demanding job. However, no action was taken by senior members of the Imperial Household Agency. On 13 July 2016, national broadcaster NHK reported that the Emperor wished to abdicate in favor of his elder son Crown Prince Naruhito within a few years. Senior officials within the Imperial Household Agency denied that there was any official plan for the monarch to abdicate. A potential abdication by the Emperor would require an amendment to the Imperial Household Law, which has no provisions for such a move. On 8 August 2016, the Emperor gave a rare televised address, where he emphasized his advanced age and declining health; this address was interpreted as an implication of his intention to abdicate. With the intention of the abdication now known, the Cabinet Office appointed Yasuhiko Nishimura as the Imperial Household Agency's Vice Grand Steward. In October 2016, the Cabinet Office appointed a panel of experts to debate the Emperor's abdication, which recommended that the law should be a one-off measure for Akihito alone. In January 2017, the Lower House Budget committee began informally debating the constitutional nature of the abdication. On 19 May 2017, the bill that would allow Akihito to abdicate was issued by the Japanese government's cabinet. On 8 June 2017, the National Diet passed a one-off bill allowing Akihito to abdicate, and for the government to begin arranging the process of handing over the position to Crown Prince Naruhito. The abdication has been set to occur on 30 April 2019. He will receive the title of Jōkō (上皇, Emperor Emeritus), an abbreviation of Daijō Tennō (太上天皇), upon abdicating, and his wife, the Empress, will become Jōkōgō (上皇后, Empress Emerita). On 1 December 2017, the Imperial Household Council, which had not met in 24 years, did so in order to schedule the ceremonials involved in the first such transfer of power in two centuries. The Imperial Household Council consists of the Prime Minister, the Speaker and Vice-Speaker of the House of Representatives, the President and Vice-President of the House of Councillors, the Grand Steward of the Imperial Household Agency, the Chief Justice and one justice of the Supreme Court, and two members of the Imperial Family. Prince Akishino, the Emperor's younger son, has been asked to stand down as he is an "interested party" in the matter. He was replaced by Prince Hitachi, the Emperor's 82-year-old younger brother, the other one is Hitachi's wife Princess Hanako. Chief Cabinet Secretary Yoshihide Suga told reporters that the date was chosen to permit the old Emperor to be able to preside over a 30th anniversary Jubilee and to coincide with the Golden Week annual holiday period, turning the changeover from a period of mourning and makeshift ceremonial into a joyous, well-planned, festival. Finally, on December 8, 2017, the government created a special committee to oversee the events. According to Chief Cabinet Secretary Yoshihide Suga: "It will deal with the matter properly, taking into consideration the possible impact on the people's lives." The committee met for the first time in January 2018, and the following month announced that a plan called a "basic policy statement," was released on April 3. Official farewell celebrations began with a 30th Jubilee ceremony on February 12, 2019, a delay which would avoid any implication of a celebration of the death of the Emperor Shōwa on January 7. The government has consolidated the Golden week holidays into a special ten day block lasting from April 27 to May 6. Had the transition not been scheduled in advance, April 29 and May 3–6 are already national holidays in 2019, following the weekend of April 27–28. The abdication and enthronement would both be national holidays, and public holiday law states that a regular work day sandwiched between two national holidays would become "Public" holidays. Chief Cabinet Secretary Yoshihide Suga announces the new Imperial era "Reiwa" to the press. Since the Meiji Restoration in 1867, a new Japanese Era starts the day after the old Emperor dies. However, in Emperor Akihito's case, manufacturers of calendars, forms, and other paper products need to know the new Era's name in advance to produce wares in a timely manner. While the Era names for the Shōwa and Heisei eras were kept state secrets until the deaths of the previous Emperors, that was not possible in this case, because an abdication is unprecedented since the 1885 Meiji Constitution was adopted. In order to prevent divisive debate on the subject, delaying the announcement as late as is practically possible, either the old Emperor's birthday or his jubilee celebrations had been suggested. Until the Era name became known, computers and software manufacturers needed to test their systems before the transition in order to ensure that the new era will be handled correctly by their software. Some systems provide test mechanisms to simulate a new era ahead of time. 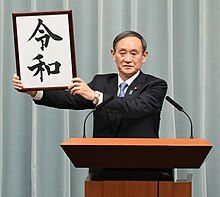 The new Era name, "Reiwa" (令和), was revealed on 1 April 2019 by Chief Cabinet Secretary Yoshihide Suga during a televised press conference. The Enthronement Ceremony for Emperor Naruhito is scheduled to take place on 22 October 2019, marking the end of the transition period. It is to be an extra holiday. Emperor Akihito informs his advisory council that he would like to eventually retire and to help him arrange it. July: Emperor Akihito leaks to the press his wishes to retire. July 13: NHK reports his wishes to the public. August 8: The Emperor makes address to the public on television and radio implying the above wish. September: Prime Minister Shinzō Abe appoints a committee to investigate the legal ramifications of a possible abdication. January 12: Public debate on abdication in the House of Representatives Budget committee. May 11: A report of a joint committee of the National Diet recommends a one-off bill to facilitate the first imperial abdication in two centuries. May 19: The Cabinet of Prime Minister Shinzō Abe introduces the abdication bill. June 8: The abdication bill passes the House of Representatives (Lower House). June 9: The abdication bill passes the House of Councillors (Upper House). November: The Cabinet suggests that 30 April 2019 will be a good date. December 1: The Imperial Household Council, which has not met in a quarter century, does so and approves the date suggested. December 7: The Cabinet approves the date, authorizing the creation of an "imperial transition committee" to oversee the ceremonies involved, with Chief Cabinet Secretary Yoshihide Suga as Chairman. January: The committee meets for the first time. February 20: Preliminary paper on official ceremonials issued stating that the abdication will be a state occasion. April 3: White Paper on official ceremonials is issued by the committee. December 23: The final celebration of the Emperor Akihito's birthday as Emperor. January 8: 30th Anniversary Jubilee begins with commemoration ceremonies for the Emperor Shōwa. Start of official farewell celebrations for Emperor Akihito. February 14: A survey was listed out for suggestions about Naruhito's era name. February 24: Jubilee celebrations at the National Theater. February 25: The Imperial Household Agency announces that Akihito and Michiko's English titles upon abdication will be His Majesty The Emperor Emeritus and Her Majesty The Empress Emerita, respectively. March 12: Traditional private abdication ceremonies and rituals began with the Kashikodokoro-ni-Taii-oyobi-sono-Kijitsu-Hōkoku-no-gi ceremony. Kashikodokoro-ni-Taii-oyobi-sono-Kijitsu-Hōkoku-no-gi (賢所に退位及びその期日奉告の儀) in which Emperor Akihito reports his abdication to the sun goddess Amaterasu-ōmikami at the Kashiko-dokoro of the Three Palace Sanctuaries of the Imperial Palace. Kōreiden-Shinden-ni-Taii-oyobi-sono-Kijitsu-Hōkoku-no-gi (皇霊殿神殿に退位及びその期日奉告の儀) in which Emperor Akihito reports his abdication to the Ancestral Spirits of the Imperial Family from one year after their death and the Amatsukami (天津神) from Takamagahara and Kunitsukami (国津神) from Japanese mythology at the Kōrei-den and Shin-den of the Three Palace Sanctuaries of the Imperial Palace respectively. Jingū-Jinmu-Tennō-Sanryō-oyobi-Shōwa-Tennō-izen-Yondai-no-Tennō-Sanryō-ni-Chokushi-Hakken-no-gi (神宮神武天皇山陵及び昭和天皇以前四代の天皇山陵に勅使発遣の儀) in which Imperial messengers and priests are sent to the Ise Grand Shrine, the mausoleum of Emperor Jimmu, and the mausoleums of the 4 most recent Emperors to report Emperor Akihito's abdication. March 15: Traditional private abdication rituals. Jingū-ni-Hohei-no-gi (神宮に奉幣の儀) Imperial messengers and priests made offerings and reported Emperor Akihito's abdication at the Ise Grand Shrine. Jinmu-Tennō-Sanryō-oyobi-Shōwa-Tennō-izen-Yondai-no-Tennō-Sanryō-ni-Hōhei-no-gi (神武天皇山陵及び昭和天皇以前四代の天皇山陵に奉幣の儀) Imperial messengers and priests reported Emperor Akihito's abdication to the mausoleum of Emperor Jimmu, and the mausoleums of the 4 most recent Emperors. March 26: Jinmu-Tennō-Sanryō-ni-Shin'etsu-no-gi (神武天皇山陵に親謁の儀) The Emperor and Empress paid respects at the mausoleum of Emperor Jimmu in Kashihara, Nara Prefecture, Japan. April 1: The new Era name is approved by the Cabinet, and is officially announced to the public by Chief Cabinet Secretary Yoshihide Suga as "Reiwa" (令和). April 18: Jingū-ni-Shin'etsu-no-gi (神宮に親謁の儀) The Emperor and Empress pay respects at the Ise Grand Shrine in Ise, Mie Prefecture. April 21: Local elections happen in Japan. April 23: Shōwa-Tennō-Sanryō-ni-Shin'etsu-no-gi (昭和天皇山陵に親謁の儀) The Emperor and Empress pay respects at the mausoleum of his late father, Emperor Shōwa, at the Musashi Imperial Graveyard in Hachiōji, Tokyo. April 27: Extra Holiday: Start of Golden Week holiday season. April 30: Taiirei-Seiden-no-gi (退位礼正殿の儀) Emperor Akihito announces his resignation from the throne and receives audience with the representatives of the people for the last time. He becomes the first Jōkō since 1840. Heisei period comes to an end. May 1: Beginning of the Reiwa period and scheduled accession date of Emperor Naruhito. Kenji-tō-Shōkei-no-gi (剣璽等承継の儀) Emperor Naruhito inherits two of the three Imperial Regalia of Japan, as well as the Privy Seal, and the State Seal. May 6: Extra Holiday: End of Golden Week Celebrations. Sokui-go-Chōken-no-gi (即位後朝見の儀) in which Emperor Naruhito meets for the first time with the representatives of the people. Sokuirei-Seiden-no-gi (即位礼正殿の儀) in which Emperor Naruhito proclaims the enthronement and receives felicitations from representatives of the people from at home and abroad. Shukuga-Onretsu-no-gi (祝賀御列の儀) Procession to show and receive good wishes from the people by motorcar. February 23: The first celebration of Naruhito's birthday as Emperor. April 19: Prince Akishino will be promoted to Kōshi (a rank equivalent to Crown Prince). The following table lists abdication and enthronement ceremonies in chronological order. Private ceremonies are listed as "Private". State acts are listed as "Public". ^ Jiji, Kyodo, "Emperor Akihito's abdication may push back timing of constitutional reform" Japan Times, January 5, 2017. ^ "Enthronement ceremony for Japan's next emperor seen in fall 2019- Nikkei Asian Review". Asia.nikkei.com. Retrieved 6 January 2018. ^ a b "Do Not Let the Emperor's Abdication Be an Occasion for Cynical Political Gain - JAPAN Forward". Japan-forward.com. 11 May 2017. Retrieved 6 January 2018. ^ a b "The Emperor's Abdication: Sixteen Months of Muted Conflict - JAPAN Forward". Japan-forward.com. 9 December 2017. Retrieved 6 January 2018. ^ Osaki, Tomohiro (1 December 2017). "Japan sets date for Emperor Akihito's abdication as April 30, 2019". Japantimes.co.jp. Retrieved 6 January 2018. ^ "April 30 most likely date for Emperor Akihito's abdication: government sources". The Japan Times. 22 November 2017. ^ "Gov't to hold meeting Dec 1 to discuss emperor's abdication date". Japan Today. Retrieved 26 November 2017. ^ "Emperor Akihito to abdicate on April 30, 2019". Japantoday.com. Retrieved 6 January 2018. ^ "Special panel set to formally approve Emperor Akihito's abdication date as April 30, 2019". Japantimes.co.jp. 5 December 2017. Retrieved 6 January 2018. ^ a b NEWS, KYODO. "Basic plan for Japan's imperial succession rites in 2019 approved by gov't". ^ a b "Government pencils in February 2019 ceremony to mark Emperor's 30 years on the Chrysanthemum Throne". 15 February 2018 – via Japan Times Online. ^ "Plan ahead: Japan to consider 10 consecutive days off around Crown Prince's succession". Japantimes.co.jp. 6 December 2017. Retrieved 6 January 2018. ^ "Big headache for calendar publishers if new Emperor's era name announcement delayed". Japantimes.co.jp. 14 June 2017. Retrieved 6 January 2018 – via Japan Times Online. ^ "Japan's Heisei Emperor Departs, Taking his Calendar - Asia Sentinel". Asiasentinel.com. 7 December 2017. Retrieved 6 January 2018. ^ "Japan may delay release of new era name until year-end or later". 17 February 2018 – via Japan Times Online. ^ "The Japanese Calendar's Y2K Moment". ^ Denyer, Simon (1 April 2019). "Japan names new imperial era 'Reiwa,' a symbol of the country's hopes for the future". Washington Post. Retrieved 2 April 2019. ^ "Japan May Make New Emperor's Proclamation Date Nonworking Day (News)". 13 February 2018. ^ a b "Japanese emperor's abdication ceremony to be state occasion". asia.nikkei.com/. 20 February 2018. ^ KellyReporter, Amy Eloise (9 January 2019). "Thirtieth anniversary of father's death commemorated by Emperor Akihito". ^ "Japan's Emperor Akihito to be addressed with 'emeritus' after abdication". The Japan Times. 26 February 2019. Retrieved 13 March 2019. ^ a b c d "Emperor performs 1st ceremony associated with abdication". Mainichi Daily News. 12 March 2019. Retrieved 23 March 2019. ^ "Name of Japan's next Imperial era to be announced April 1, Abe confirms". The Japan Times. 4 January 2019. Retrieved 4 January 2019. ^ "calendar 2019". The Japan Times. 7 January 2019. ^ "Government to present new era name to Emperor and Crown Prince before April 1". The Japan Times. 3 February 2019. Retrieved 20 February 2019. ^ "Government to designate May 1, day of new Emperor's accession, as public holiday, creating 10-day Golden Week in 2019". The Japan Times. 12 October 2018. Retrieved 20 February 2018. ^ Tajima, Nobuhiko (17 January 2019). "Emperor to give final speech at abdication ceremony". Asahi Shimbun. Retrieved 20 February 2019. ^ "Japan sticks with tradition and excludes female imperial family members from Crown Prince Naruhito's enthronement". South China Morning Post. Associated Press. 30 March 2018. Yasuhiko Nishimura, vice grand steward of the Imperial Household Agency, said it will hold the Daijosai, or Grand Thanksgiving rite, on November 14 and 15, 2019 – the most important ceremony after enthronement during which the new emperor will eat rice harvested that year to appreciate the country’s bounty of grain.